Now, since SnTT has also its own logo, I reckon Forum Friday could use one too. So here’s my proposal. The thoughts behind it: if you have a problem in Notes, it can really be like a strong bull that takes over, that makes it impossible to work further. The one that answers the question is the one that controls the bull, that manages to tame the beast. Let me know what you think and if there’s something that can be enhanced to it. If the logo is ok (or after some adjustments), I will post it in different sizes for download. 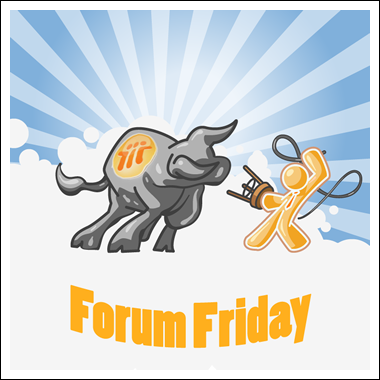 Personally I think the image is ok, except for the Forum Friday text itself, but I can’t put a finger on it what’s wrong with it. Looks good but how will it look when it’s been shrunk in size. Thinking about it I’d love to see an image of just the guy with the chair and whip about 60% of the size he currently is now. There does not need to be any text. If you could email an image like that that would be cool. Or drop the chair and add a Fedora hat. give something clean of excise, notional.